The building menu. The numbers in parentheses show the quantity built. The Building menu can be accessed from the main menu by pressing the b key. This allows your dwarves to build anything listed within the menu, provided you have access to the proper materials. This list also contains several sub-menus which expand to show further building options. Any item within this list, once built, can then be interacted with using the q:Set Building Tasks/Prefs key. All buildings can be disassembled into their original parts and removed using the x key while within the q menu. 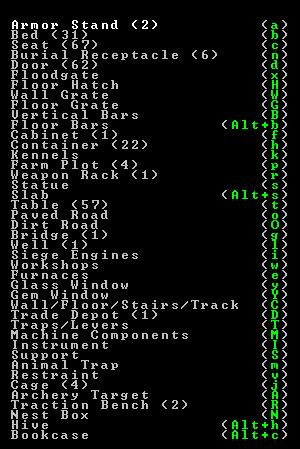 You can also use t:View Items in Buildings to look at the items currently stored within an individual building as well as which items were used to construct that particular building. The exception to this rule are items located under the C:Walls/Stairs/Floors sub-menu. These items are considered Constructions, and as such, have no interactions available. These items are removed using the d:Designations-n:Remove Construction key. For more detail on how buildings and constructions interact, please see the Construction article. When a building gets designated for construction, the items designated to be used in the construction will be reserved for that building, meaning that other dwarves will not use that specific item for something else.